Even Haliimaile homeowners, who know a lot about plumbing need help once in awhile, so do not feel shy about asking for help for your next remodeling project or plumbing emergency. You never know when you are going to need professional assistance so always make sure you find and keep a reputable Haliimaile plumber's contact information nearby. To find a good plumbing contractor, do not be afraid to ask your friends and family or even the people you work with, to recommend a good Haliimaile plumber they have dealt with before. The yellow pages are not the best place to find a plumber because anyone can advertise their services, regardless of how badly they provide them. When you are up to your waist in a plumbing help emergency, you do not want to be concerned with finding the best plumbing help at the cheapest rate. This is the reason that you should find someone capable and reputable before you need his services. 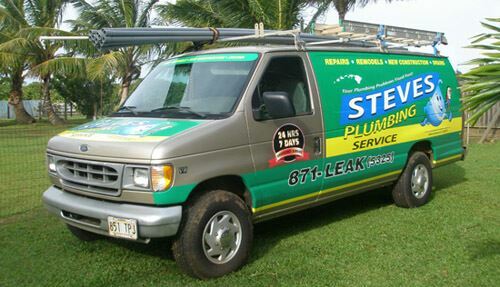 Steve's Plumbing provides Haliimaile area homeowners with their plumbing and drain cleaning needs. Customers are serviced the same day their call is received and expert technicians are trained to provide service according to the industry s highest quality standards.